Meaning the 'great white place of dry water', Etosha National Park is a vast and varied area of shimmering mirages, desert, savannah, and scrubby woodlands. The park is situated some 270 miles (435km) north of Windhoek. Its unique landscape is characterised by an immense, flat white saltpan, a shallow depression that is dry for the greater part of the year and fed by moisture from perennial springs on the fringes. The pan covers about 25% of the park. The saltpan was once a vast lake fed by the Kunene River. But it changed course thousands of years ago, leaving a dry hollow of salt and cracked clay. Today it fills up for a short while after heavy rain. The temporary water supply attracts thousands of water birds during the rainy season, including flocks of pink flamingos, but the best time for viewing animals in Etosha is the cool dry season, between May and September. Etosha has three campsites: Okaukuejo, Namutoni, and Halali. Although visitors can't leave the camp areas at night, there is a carefully lit watering hole at each campsite allowing for night game viewing from the safety of the campsite. Okaukuejo Campsite is located 10 miles (17km) from the park's southern entrance. The waterhole has benches and viewpoints and the camp is equipped with overnight accommodation facilities, camping sites, a restaurant and bar, a curio shop, and a swimming pool. Namutoni Campsite is located on an old German fort. Found at Etosha's east gate and overlooking the King Nehale watering hole, it has great game viewing opportunities. The campsite has a small grocery shop, bookshop, craft boutique, jewellery, and curio store. Camping and other accommodation options are available. Halali Campsite is between Namutoni and Okaukejo at the base of a dolomite hill, just south of the main Etosha Pan. The watering hole is lit up at night and an elevated vantage point gives visitors the chance to watch nocturnal animals as they arrive at the pan. Lodging options and camping facilities are available and there is also a swimming pool at the campsite. 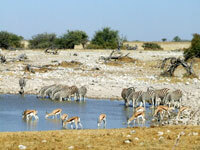 In recent years, the Namibian Wildlife Resorts authorities have upgraded the accommodation at Etosha campsites. Some of the upgrades were necessary, but some just took place as a means to increase the accommodation and campsite fees in Etosha. If you are travelling to the park, be sure to book in advance and double check both availability and charges so that you are not surprised by an astronomical bill. The salinity and rich mineral content of the pan attracts a huge diversity of animal and birdlife to the park, making it an excellent place for game viewing. The expanse of the white desert makes for an extraordinary backdrop. Etosha has a network of roads linking its three rest camps. Visitors can expect to see many species of antelope, wildebeest, zebra, lion, giraffe, and Africa's tallest elephants. Several of the animal species are endangered, including the black rhino. There are also opportunities to see lion, leopard, and cheetah around the many waterholes scattered throughout the park. We are looking for contributors for our Etosha National Park travel guide. If you are a local, a regular traveller to Etosha National Park or a travel professional with time to contribute and answer occasional forum questions, please contact us.